Emyhost Review 2019: Is Emyhost a Good Hosting? 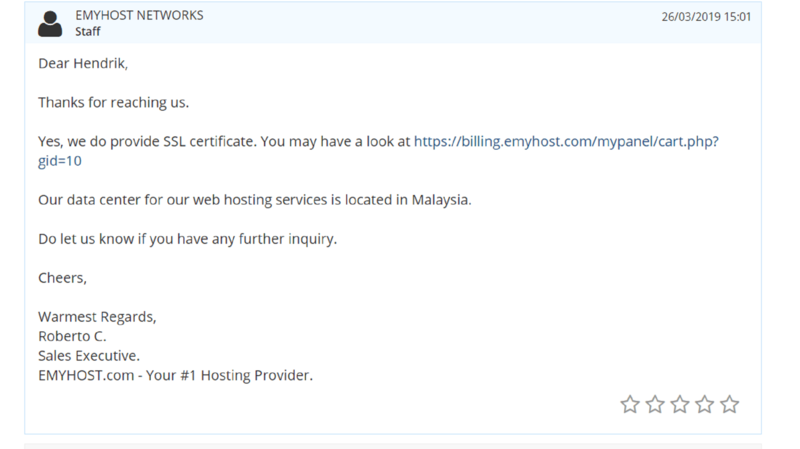 Emyhost has local (Malaysian) and international data centers, from which it provides affordable Windows and Linux hosting packages with a very reassuring 100-day money-back guarantee. Malaysia-based web hosting company Emyhost Networks (Emyhost) was founded in 2009. With data centers also located in the United States and the Netherlands, it offers offshore hosting services as well as an affordable range of shared, VPS, and dedicated server hosting products with 24/7 support and a choice of either Linux or Windows solutions. All Emyhost’s hosting services are offered in both Linux and Windows variants. Each comes with features appropriate for the particular operating system, such as MySQL and cPanel for Linux, or Plesk and MSSQL for Windows. Although the Windows plans don’t come with as much storage or bandwidth as the Linux plans, both provide more than enough resources for most websites. But for even more bandwidth, you should choose a VPS with up to 4 TB of bandwidth. When it comes to all the essential hosting features, Emyhost really delivers. Developers will like the support for all the essential software frameworks as well as SSH access. Everyone will welcome the popular cPanel and Plesk control panels. A 99.9% network uptime and 99.5% server uptime guarantee mean that you can be confident enough about stable hosting, although they’re nothing spectacular. Emyhost looks like a very affordable host with attractive prices. Although there is no unlimited hosting, the high storage and bandwidth limits will be more than enough for most users. However, the Windows packages are a little more limited than the Linux ones. While many cheaper hosts don’t allow you to host multiple sites, this one does. It also allows you to have unlimited parked domains, subdomains, and email accounts. What makes Emyhost’s prices particularly appealing is the fact that they’re not just introductory prices, and the prices are frozen from the minute you sign up. You also get a much-better-than-average 100-day money-back guarantee that gives you plenty of time to decide if this really is the host for you. You can sign up on a monthly, annual, or biennial billing basis, but the monthly hosting incurs a small setup fee. However, you get two months free with annual billing and four months free with biennial billing. With very affordable prices and an almost unbeatable 100-day money-back guarantee, there seem to be no reasons not to give Emyhost a go. The value-for-money is underlined by solid features and good (but not great) uptime guarantees. Get affordable offshore hosting from Emyhost. Wondering how Emyhost stacks up against other Web Hosting companies? Enter any other Web Hosting company and we will give you a side-by-side comparison.